Are you waiting for your website to look 100% perfect before you dare reveal it to the world? Spending hours searching for the perfect images to help you stand out from the competition? Wasting days on end playing around with words and content to try and sound clever, and slightly cool, but still professional? Putting your website ‘on hold’ until that professional photographer can fit you in for your perfect photographs and brand images? There is no such thing as perfection, particularly when it comes to marketing your business. And waiting until you think your website ticks every box going (and a few extra for good measure) can be detrimental to your business. Your website is available 24/7: regardless of whether your potential visitors are in York or New York, they can wander through your website any time they choose. But if you’re faffing around with it, searching and trying to upload only the BEST images, and waiting until you’ve recorded a POSITIVELY PERFECT VIDEO (that took you at least 48 times and countless hours to get right) and your website is in ‘Maintenance Mode’ all this time, the only people to win from your perfection tendencies will be your competitors. Your website is an ever-evolving marketing tool and even the most functional, gorgeous and converting websites grow – which means that even if they are teetering on perfection, this can change overnight. As your business evolves, so does your message, and what felt right in terms of your website content, images, and maybe even the layout, 12 months ago, may not be the case today. So all that striving for this short-term perfection is not the best use of your time or resources. Your website is so easy to update anyway. If you have a WordPress website, updating it doesn’t have to be a huge task. So instead of waiting for perfection, get your good enough website out there and tweak the other bits later. Does your website look professional, clean, simple and uncluttered? Is your written content error-free / typo-free? Is your brand message clear and easy to understand? Does your website function well – do all the links work? Is your website easy to navigate – try your visitors’ experience by clicking on the home page and following the route they may take > Services > Blog > Testimonials > Contact Page, etc) to find out. 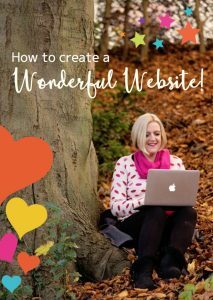 Delegating – if working on your website isn’t your zone of genius, then delegate it to someone like me who loves nothing more than creating wonderful websites! Similarly, if you’re struggling with the content, ask colleagues to recommend a copywriter who specialises in writing web pages. Breaking your tasks down into bite-sized chunks – it’s easy to get lost on Pixabay or Unsplash or any of the other royalty-free images websites, so be conscious of this when you’re surfing. A much better way to work is for you to allot, say, 15 minutes to source 3 images, 15 minutes to work through the customer experience and highlight anything that needs attention, and 15 minutes to switch the layout on your pages/blog, for example. This stops you feeling swamped and overwhelmed and you’ll get much more finished. Making ‘GOOD ENOUGH IS GOOD ENOUGH’ your mantra until you believe it! If you’re looking for support with your website I have a range of online packages that could save you time and energy, particularly if you have perfectionist tendencies and are getting nowhere fast with your website. Feel free to contact me for more details.